Things might not have looked pretty early in the year, or even near halftime of today’s game, but in the end Kirk Cousins is showing why he is a starter in the National Football League. Behind 365 yards passing, four touchdowns, and poise after making an ultimate blunder from Cousins, the Washington Redskins steamrolled the Philadelphia Eagles 38-24. With Washington deferring until the second half, Sam Bradford put on a show early. Playing against a zone defense and with little pressure, Bradford was able to sit back and let his route develop. After just five plays the Eagles already had fifty yards through the air including a third down conversion. Following an offsides and unnecessary pass interference penalty in the end zone by Will Blackmon, Philadelphia was spotted the 7-0 lead. Cousins got behind in the down and distance early as the Redskins went three-and-out on their first drive. Luckily the Washington defense came up with a big play when Will Compton dropped Sam Bradford for a seven yard loss that forced an Eagles punt. Cousins found his groove as he linked up with his favorite tight end Jordan Reed. On a skinny post, the two hooked up for 28 yards to convert on first-and-15. Three plays later Reed split the safeties from the slot position and Cousins hit him over the top for an easy 22-yard touchdown. Reed is the first Redskins tight end to have double-digit touchdowns since Jerry Smith in 1967. Dustin Hopkins missed his first PAT of the year, but the Redskins were feeling better down just 7-6. Washington kept the pressure on defense as well. After forcing the Eagles into a third-and-7, pass rushers were able to tee off and forced Sam Bradford into an intentional grounding when both Ryan Kerrigan and Chris Baker broke free. With good field position, Cousins kept feeding Reed who converted on two more first downs including a third-and-5 play where Chris Thompson was superb in blitz pickup. 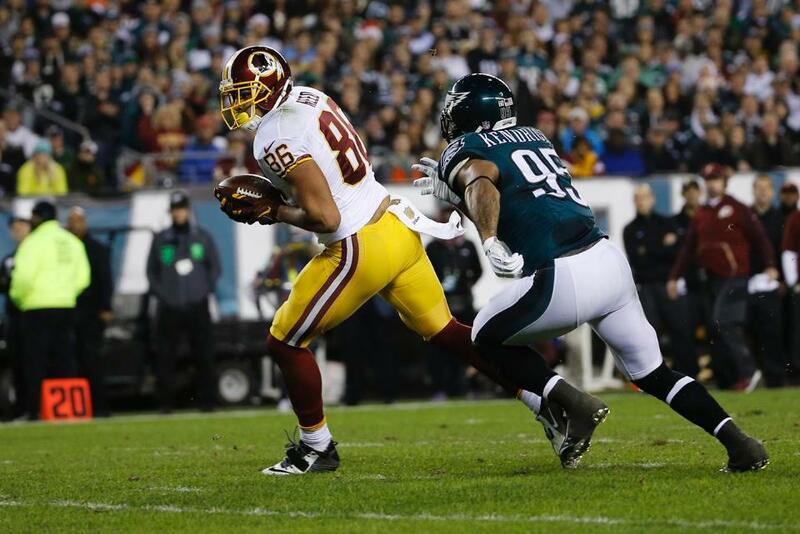 On the next play Reed shook Mychal Kendricks out of his shoes and caught a 12-yard touchdown that set the Redskins franchise record for most receiving yards by a tight end in a single season. Philadelphia looked to respond right back as Bradford beat Blackmon again on third-and-8 with a 43 yard gain to Jordan Matthews over the top. When it looked like Washington would at least give up a field goal on the drive, consecutive six yard loss tackles by Mason Foster and Preston Smith on a sack forced a punt. The Redskins were backed up to start the drive and were lucky to get away with a three-and-out punt as Josh LeRibeus had another questionable snap. The Eagles were backed up again thanks to self-inflicted pre-snap penalties, but Bradford had a chance to put all of that to bed on third-and-9. Tight end Zach Ertz streaked down the Philadelphia sidelines wide open but was overthrown thanks to pressure from Will Compton. Quinton Dunbar was expecting safety help from DeAngelo Hall on the play but that was not the case. Washington got away with a huge break, but had to punt the football right back after Morgan Moses was beat by the Pro Bowler Fletcher Cox. Bradford started to expose the Redskins coverage against tight ends with back to back throws to Zach Ertz and then Brent Celek for 35 yards total. Bashaud Breeland had chances for interceptions twice; the first resulted in a dropped Eagles touchdown while the second on third down forced a field goal attempt.. Caleb Sturgis was true from 34 yards out to cut Washington’s lead to 13-10. Things were not looking good when Washington started their third straight drive inside their own 10 yard line. With Philadelphia getting interior pressure, Cousins had no chance to throw beyond the sticks forcing another punt. The Redskins defense had been coming away lucky not to get burned on repeated drives as momentum was starting to swing. Luckily the opportunistic nature continued for Joe Barry‘s squad. Following a missed tackle by DaShon Goldson, Breeland punched the ball out from Zach Ertz while Will Compton was holding him up. Goldson came through with the recovery that “stood” after review thanks to inconclusive video evidence. Alfred Morris, without Matt Jones, got the Redskins to the Eagles 10 before the drive stalled. Cousins threw a jump ball to Garcon on first-and-goal but the Haitian native had his second foot step out of bounds by the slimmest of margins. Two more questionable throws in goal-to-go situations forced Washington to kick a field goal; they still do not have a touchdown off of a turnover. Preston Smith beat Pro Bowler Jason Peters for the second time to get Washington the football back with forty seconds left in the half. The drive could not have started any better as a 22-yard out route to DeSean Jackson and amazing toe tap by Pierre Garcon for 25 yards has Washington within field goal range with 17 seconds remaining. Reed was tackled in bounds after a 13 yard gain and Washington was looking for a quick spike with the clock running. Luckily Eagles safety Walter Thurmond was called for delay of game for slapping the ball away from the referee. The unthinkable happened when Cousins took a knee to cause the clock to expire on the half. Instead of a FGA or a fade to Garcon for a possible touchdown, the Redskins went into intermission up only 16-10. Both sides started out the second half with punts as each defense was getting strong penetration. But Washington converted a third-and-10 and third-and-14 to Pierre Garcon and then Pierre Thomas. The Redskins were getting away with near turnovers in tight windows because of pressure on Cousins. Face with their third third-down play of the drive, the Washington passing game delivered again. Cousins fired to Chris Thompson in between two Eagles defender for a twelve yard touchdown. The Redskins had their largest lead of the game at 23-10 midway through the third quarter. A 49-yard kickoff return from Josh Huff gave Philadelphia the ball near midfield. Sam Bradford then put on a clinic. Twenty-five yards to DeMarco Murray over two plays followed by Ertz beating Kyshoen Jarrett on off coverage gave the Eagles the ball in the red zone. Kerrigan jumped offsides on a third-down play before Murray punched it in from four yards out for a quick response. Philadelphia scored in two minutes and in the same amount of time Washington went three-and-out as Cousins decided against trying to pick up the first down with his legs. With the rain starting to come down, Philadelphia had a lot of momentum. That would not be the case for long as DeMarco Murray fumbled a pitch on third-down. Instead of falling on the football Murray attempted to pick it up resulting in the pigskin being kicked away towards safety DeAngelo Hall who knew exactly what to do with it. The rest was history, and eerily similar to Sean Taylor‘s play during the 2005-06 season against these sames Eagles. Hall is the first NFL player to have five fumble recoveries for touchdowns and 5 interception returns for touchdowns in a career. The Eagles offense continued to shoot itself in the foot, as Ertz dropped a potential first down pass as the weather conditions continued to play a role. After Ryan Grant gained 24 yards to flip field position, it was the Pierre Thomas show. The veteran back combined for 42 yards on the ground and through the air to churn out important first downs for Washington. Cousins threw a beautiful ball to Garcon on third-and-goal from the 13 for the dagger touchdown once the former division three receiver shook his defender with a double move. The Redskins also converted a two-point conversion to Jamison Crowder to take a 38-17 lead with nine minutes to go. Philadelphia scored a touchdown against prevent defense, but not in their normal pace as it took over four minutes. Garcon then recovered an onside kick attempt before the Redskins punted the ball with under four minutes remaining in the game. In the end the Washington Redskins were victorious and won their fifth game in their last 24 on primetime television. Washington will play the Dallas Cowboys, potentially without Dez Bryant, next week, but are locked into the fourth seed in the NFC East playoffs. Gruden could potentially rest many of his banged up players (there are quite a few) and/or more important cogs in the team like Kirk Cousins. For the second time in four years the Washington Redskins are the NFC East Champions, and the franchise has joined a select club in reaching the 600 wins mark, including the postseason.